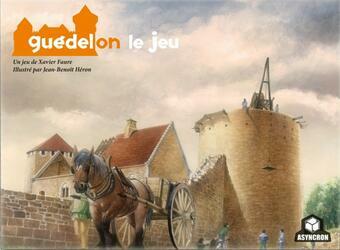 Guédelon, the game is a cooperative management game in which each player will be able to exercise different jobs and participate in the construction of the castle. You and your game partners will win (or lose) all together! You will have to produce raw materials at the stone quarry, in the forest and at the clay well, and then transport them to the workshops. These materials will be transformed into finished products at the stonemason, carpenter or tiler. You will then have to transport these finished products to the castle for use in the construction of the buildings. To produce faster, you will need to gain experience from the prime contractor and have your tools sharpened by the blacksmith. It will also be essential to go to the tailpiece maker and mason. But unforeseen events and more and more visitors may upset your projects! Guédelon: Le Jeu was funded on the Crowdfunding Kickstarter (See the campaign) platform on the 15 May 2016, the campaign lasted 30 days. 298 people helped funded the game, whose the amount requested was €10,000.00. Thanks to these 298 people the game could be funded up to €11,601.00, ~116.01%.